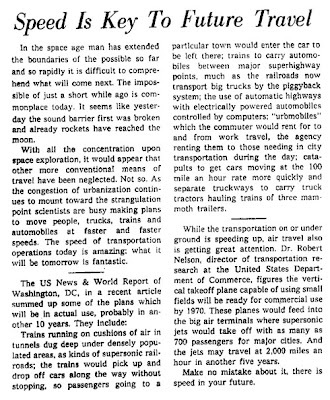 An editorial in the April 11, 1965 Modesto Bee and News-Herald (Modesto, California) describes the future of transportation. Below is an excerpt as well as the original piece in its entirety. Trains running on cushions of air in tunnels dug deep under densely populated areas, as kinds of supersonic railroads; the trains would pick up and drop off cars along the way without stopping, so passengers going to a particular town would enter the car to be left there; trains to carry automobiles between major superhighway points, much as the railroads now transport big trucks by the piggyback system; the use of automatic highways with electrically powered automobiles controlled by computers; "urbmobiles" which the commuter would rent for to and from work travel, the agency renting them to those needing in city transportation during the day; catapults to get cars moving at the 100 mile an hour rate more quickly and separate truckways to carry truck tractors hauling trains of three mammoth trailers. Impressive to see how much the environment counts when imagining the future. There´s not one thing in these past´s future images that does not belong to the reality of that time. We still see movies like Matrix, existenZ, iRobot, Minority Report and many others as the higher possibilities for our future. They try to tell us the way things will work and look like. Just like these pictures tried it in the past. 20 years from now, we´ll only think about how much of our future projections were in fact our present mixed with some "we have no idea". Scary, but also exciting. A few of the quoted predictions exist today, like trains that carry passenger cars (albeit to popular tourist destination cities, not just from highway to highway), freight hauling trucks pulling chains of three trailers (albeit on the same roads that passenger cars use), and short-term in-city car rentals.